5/7 Burakowska Street, Warsaw (in the same vicinity as the Museum of the Warsaw Uprising). I confess I went to Poland carrying several well-formed stereotypes with me. Foremost among my pre-conceived notions stood pork. In truth, I very much looked forward to visiting a Land of Pork Products at the same time that I was not looking forward to gray, drab post-Soviet architecture, blatant anti-semitism, and robust Roman Catholicism. All my preconceptions came true to one extent or another, but, on the whole, my six days in Poland turned out to delight the eye and taste buds more than I expected. I can’t say that I had outstanding food at any point. But I did have two very good meals at this wine bar, which resembles a wine warehouse as much as it does a restaurant. 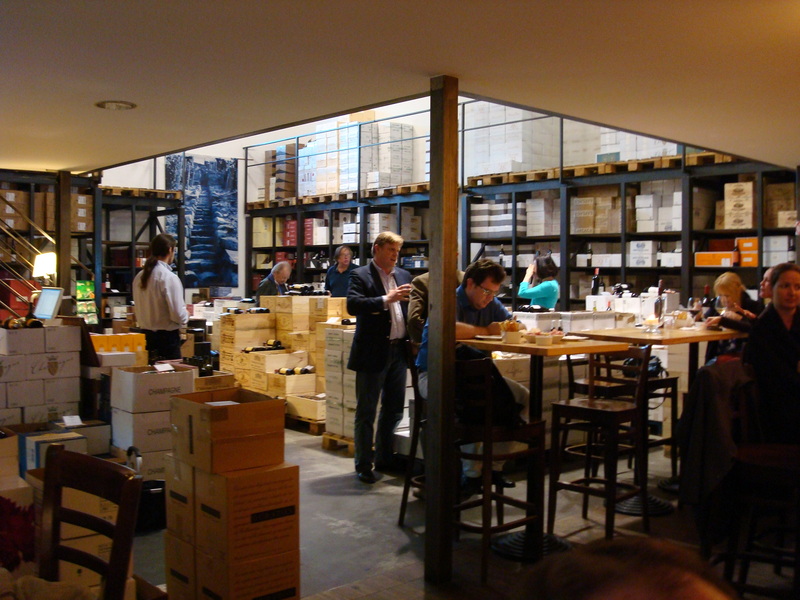 Diners walk among the boxes of wine stacked on the floor to choose what they will drink with their meal. Poland, I was chagrined to learn, does not produce its own wine — a blessing, perhaps. They import wine from western Europe and sell it at reasonable prices, although they tend to retail wines on the high end of the quality spectrum. The group of scholars I was part of ate here twice. By the second visit at the end of the week, our number had dwindled. the director generously ordered a Château Kirwan 2005 Margaux and a Château La Pointe 2001 Pomerol, the latter a little too young to drink. The star of the evening, however, was selected by the American historian of France — a Chambolle-Musigny 2003 by Frederic Magnien. I had never before drunk this bright, light red Burgundy from the Côtes des Nuits. What an epiphany! Prices? All three fell somewhere along the $50-$250 range. We drank so much I couldn’t keep track. The food here was simple but very good, except for the Polish reluctance verging on refusal to cook a steak less than well done. Asparagus was in season while we were there, so our steaks came with white and green stalks, covered in a very light buttery sauce flavored with a touch of dill. We began our meal with Italian salami and Asiago cheese. Elsewhere on our trip, we ate plenty of pork. And chicken fat, which I spread on my bread and salted at breakfast. The real surprise for me were the salads. We had wonderful Greek salads, tomato and cucumber salads, green salads, and Mediterranean pasta salads. Now, it’s time to pick up where I left off a while ago on my diet, of course.